Little melodies from the films of Laurel & Hardy. This is a sort of "concept album". As a child, one of my favorite TV shows was "Today's it's The Funnies" and I remember the excitement I felt when I heard the distinctive theme tune (the famous “Cuckoo Song”) announcing one of the Laurel and Hardy films; a long time ago now, but that joy and excitement are still as strong as ever. A collection of short pieces, performed with various instruments, (there is also some electronic!) and inspired by the films of the great Stan Laurel and Oliver Hardy. 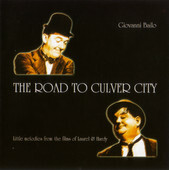 Culver City is the small town in California, where Hal Roach first set up his production Studios.